Today is all about metallic spray paint project ideas that have me wishing for warmer weather so I can get outside and paint. You will want to do the same after you see these projects. My first metallic spray paint project back in 2013 got me hooked on the look. Shine and shimmer is hard to beat and what a way to add a bit of glam to your room. Small doses are the way to go. Metallic gold, silver, bronze, or copper can be used to update just about any old home decor item or even a piece of furniture quickly. I don’t know that I would do a complete furniture makeover using spray paint only. Might be overkill. Metallic drawers, legs, hardware, or stripes add just the right amount of shine to your furniture project. 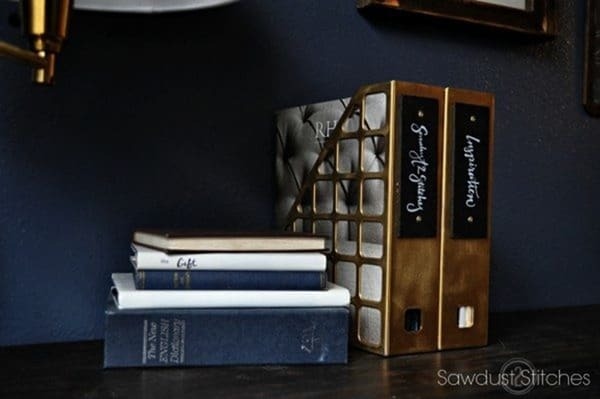 Think about all the places you can use metallic spray paint for a dramatic effect. Think outside the box. Materials like stone, concrete, and terra cotta look great in metallic tones. All you need is your project piece, a bit of creativity, and a well-ventilated space (or preferably outdoors). I’ve picked out some favorite metallic spray paint projects as inspiration for me and you! 2. Garment Clothes Rack Makeover. I told you that spray paint projects could be simple, right? If you have one of these plastic garment clothes racks (or anything plastic) just sitting around, why not give it an update with some bright and cheery metallic paint? It’s a facelift that is super simple and immediate. This clothes rack doesn’t look like plastic anymore. 3. DIY Side Table with Greek Key Base. What a great story. Kristi loved a side table sold by a large box store, but not the price tag of over $500, so she decided to make the table herself. The outcome? A stunning side table that proves sometimes knockoffs are the better than the original. Metallic paint sealed the deal. 4. Faux Mercury Glass. Okay, so I’m fudging a little on this one. This project was too good to pass up. The faux mercury pieces I made are painted with Looking Glass mirror-like spray paint. I haven’t thought about the mercury glass project in a few years. Remember when making your own mercury glass was a thing?? I did an awesome job on the glass containers if I do say so myself. They really look like mercury glass. 5. Master Bathroom Mirror. Talk about a beautiful focal point that was created simply by spray painting the outer edge of a bathroom mirror. It also shows you can use one simple process that shows you can give metallic paint an antique look. 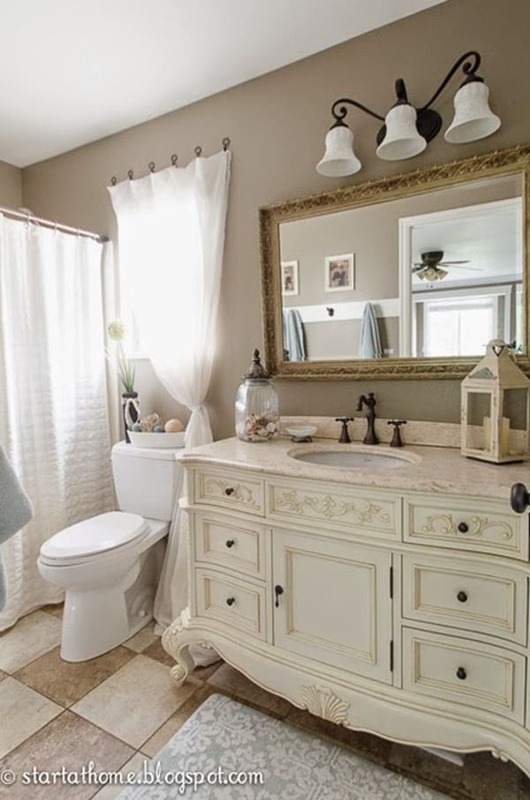 That bathroom vanity is a stunner too! I love the drawer details. 6. Vintage Desk Makeover. The pulls on this desk were given a new life with gold metallic spray paint. Not all projects have to use the paint everywhere, and this furniture makeover shows how just a pop of metallic paint is eye catching. You guys know I use metallic spray paint to update furniture hardware a lot. Saves money and the hardware really pops. 7. French Stool Makeover. 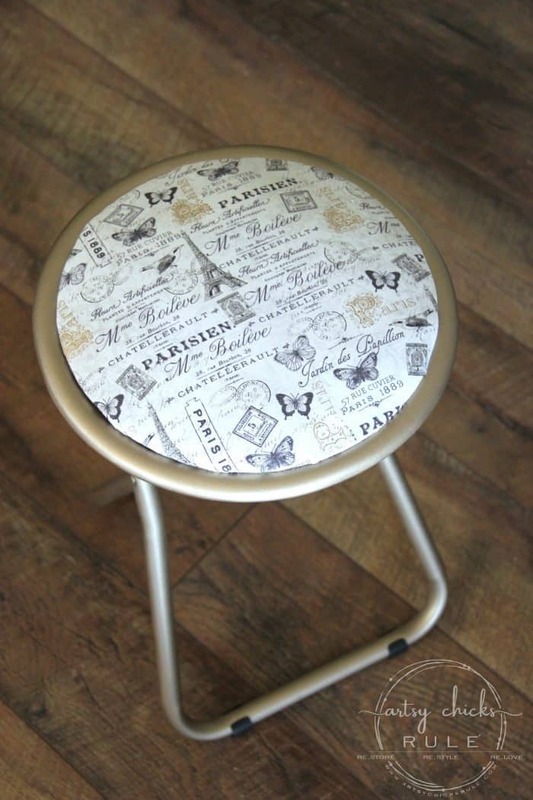 This shows how an ordinary…..okay, boring…..stool can become a focal point with a fabric change and gold spray paint. 8. Painted Tall Vase. A simple spray paint job that shows metallic paint does a great job at making any type of surface “pop”. The large vase had a really rough uneven surface and the shimmery metallic paint shows off the vase perfectly. 9. Metallic Gold Stripe Furniture. 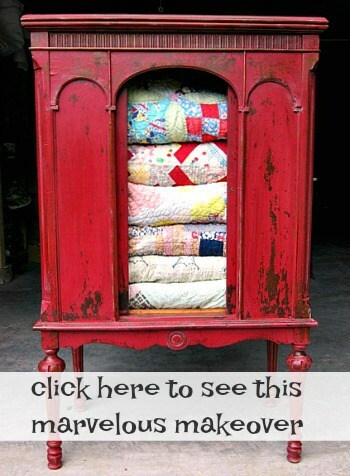 You guys have seen this furniture makeover if you hang out here often. I spray painted a metallic rose gold stripe on my black chest of drawers. That chest of drawers is sure classy. 10. Repurposed Candle Sconce Towel Rack. Fun, unique and full of creativity, I love everything about this simple DIY project. The subtle use of the metallic paint is perfect and adds a unique look. 11. Spray Painted Light Fixture. 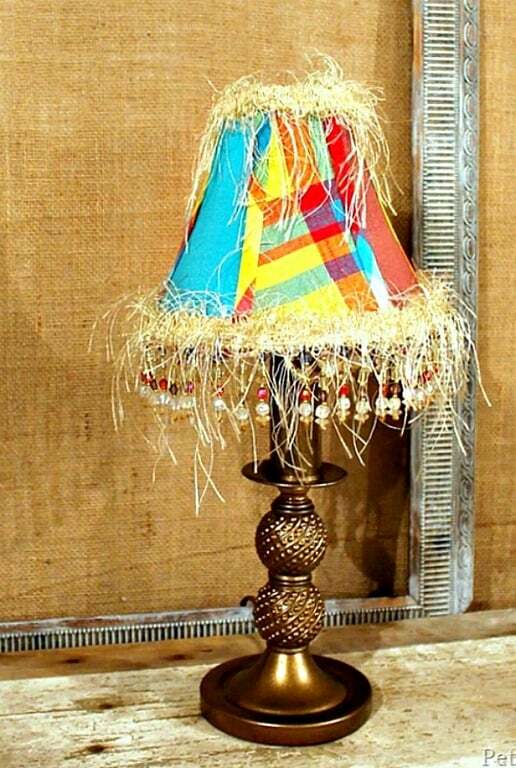 Ya’ll this project caught my eye because I spray painted a fixture almost identical to this one for our house in Florida. I wasn’t blogging or taking photos of everything then so no pics of my makeover. Angie used metallic antique brass on the light fixture. What an improvement. 12. DIY Wood Rustic Wheelbarrow. Ursula made this wood wheelbarrow for a cute yard display and painted it with one of my favorite spray paint colors……champagne mist. 13. DIY Metallic Terracotta Pots. Using burlap to add a bit of design to the pots with silver and gold spray paint was genius. You have to see these pretty pots. 14. Organizer Re-Vamp. These organizers wowed me. Just by scuffing up the plastic a bit and using a can of gold metallic spray paint the ugly plastic organizers took on a whole new look. Do you see the wow factor? The shading caused by using the sandpaper adds depth to the finish. No flat, one dimensional look here. 15. Shiny Brass Door Hardware. You don’t have to buy new hardware for your doors. You can spray paint anything from door knobs to door knockers, to kick plates. Give it a try. This is a quick and inexpensive way to update your front door entry way. Ready for your first metallic spray paint project? Start with something easy, maybe a terra cotta pot, and go from there. 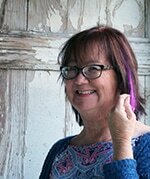 Remember that you are creating something for yourself and your home, and if you love your finished project …..well then, do the happy dance! Like you, I like using the metallic spray paint. Makes for a classy – rich looking item once finished with metallic.